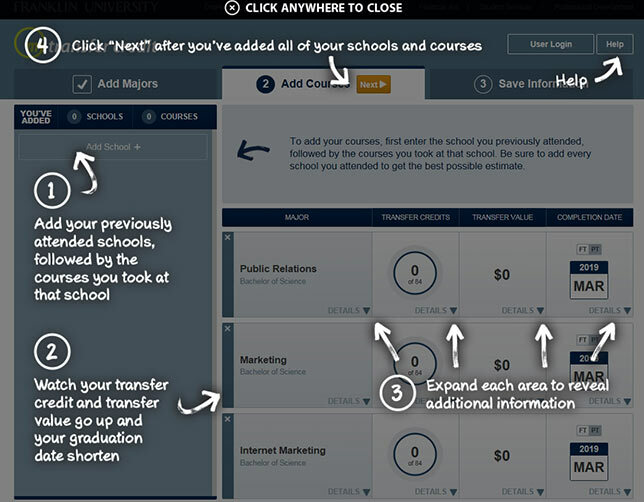 Ohio-based Franklin U found a way to mash marketing and IT to help shape the student experience in choosing a new school. The results are amazing. Franklin University is on a roll. This modestly sized not-for-profit four-year institution in Columbus, OH launched its own learning management system in 2013, acquired another university in 2014 and plans to launch a new division — Ohio National University, specifically to attract international students to its online programs this year. It pitches itself to potential students — the working adult — as offering "generous" transfer credit, focusing on "speed to degree" and being affordable. But what sets Franklin apart from every other institution promising something similar is that candidates can figure out for themselves just how those promises stack up through "myTransferCredit," an online tool created entirely by in-house IT. The results so far are remarkable. Franklin points to a 13 percent increase in new undergraduate student enrollment specifically tied to myTransferCredit. The institution had been experiencing a decline in enrollment. To turn that around, Franklin CIO and Vice President of IT Richard Sunderman worked with Scott Booth, the university's executive director of marketing and enrollment, to use data specifically to attract transfer students — and to woo them faster. As Booth and Sunderman explained in a recent presentation at the CT Forum conference in Long Beach, CA last week, the decision-making process for prospects was becoming more complicated. They might see or hear a commercial, do an online search, then be exposed to display ads, reach out to their personal networks for feedback and do additional research outside of the institution to sort out their options. "It's not uncommon to 'touch' someone upwards of 50 times as they go through this process," said Booth. The result was a certain level of paralysis. Circa 2011, for example, it wasn't uncommon for the school to receive an inquiry from a student and have that person enroll in the same term. At that time only about a fifth of applicants were what the university considered "delayed," putting off their start date by a term or two. Now delayed students make up about half of the applicant pool. As Booth and Sunderman dug into why that was happening, they realized that students were becoming more intentional in their decision-making for two primary reasons: Colleges were competing more fiercely, and there was a lot of negative publicity regarding whether or not a college degree still had value. It was tougher for prospects to know what to do. That led to a fundamental question, Booth said: How could Franklin "further differentiate" its "generous transfer credit to reduce admission decision delay and increase enrollment?" One way to do that was to pull up discussion about the value of transfer credit earlier in the decision — making process rather than waiting until a student had actually applied for admission. A good place to start was with the institution's considerable community college partnerships. Franklin had articulation agreements with 233 community colleges in nearly every state in the country. For many of those programs the university had built specific articulation pathways to help potential students figure out the value of their college credits toward bachelor's degrees. "Under our nose was this fairly massive database of transfer," noted Booth. From there it took a strategic leap by IT to figure out how to create a program comparable to a UPS or FedEx tracking system that would allow prospective students on their own to understand the value of Franklin in terms of speed to degree, transfer and cost. On the back end is the artful use of information maintained in Franklin's Ellucian Colleague ERP data stores. Through the efforts of a registrar's office, which has culled details from numerous college catalogs, both two-year and four-year, the university has piled up a "ton of data" about transfer course equivalencies. "We have about 115,000 course equivalencies contained within the college system, from just under 1,400 organizations," explained Sunderman. Anybody can come to the site and use the application without logging in. The person selects one or more majors, and a wizard-like structure guides the user through adding all schools he or she has attended, as well as all courses passed at each of those schools. Then the app displays the number of transfer credits allowed (up to 84) by major, the transfer value and the estimated completion date for earning the degree. The program also provides alternative majors related to the major and courses specified to give the prospect suggestions about options that might have a better transfer value. A majority of students stick with their programs, even when they might save money and time going with another choice, said Booth. When a prospect saves his or her information, the results are pushed to Talisma CRM, enabling Franklin to reach out to prospects for follow-up. The use of self-service is especially appealing to millennials. Booth recalled an adult student who had come into the institution with her mother to talk about transferring from another four-year school. Both were sitting with an admissions officer, and her mother was saying to the admissions person that they just needed to make sure the credits from the previous college would transfer. The younger woman responded, "Don't worry, Mom. I've already gone out to myTransferCredit to see what transfers." The application is averaging about 5,000 visitors a month currently. About 1,500 of those evaluation efforts end up being saved, generating more than 700 decent leads. Booth estimated that about 17 percent of enrollment is being "driven off the tool," not counting individuals who may already be in the university's systems. "We're very pleased with the tool," he said. "It's doing the things we wanted."